"It matters very little to me," said Martin coolly, "whether you have set up as a vagabond on your own account, or are still trading on behalf of Mr. Slyme. I wish to hold no correspondence with you. In the devil's name, man" said Martin, scarcely able, despite his vexation, to repress a smile as Mr Tigg stood leaning his back against the shutters of a shop window, adjusting his hair with great composure, "will you go one way or other?" "You will allow me to remind you, sir," said Mr Tigg, with sudden dignity, "that you — not I — that you — I say emphatically, you — have reduced the proceedings of this evening to a cold and distant matter of business, when I was disposed to place them on a friendly footing. It being made a matter of business, sir, I beg to say that I expect a trifle (which I shall bestow in charity) as commission upon the pecuniary advance, in which I have rendered you my humble services. After the terms in which you have addressed me, sir," concluded Mr. Tigg, "you will not insult me, if you please, by offering more than half-a-crown." Martin drew that piece of money from his pocket, and tossed it towards him. Mr. Tigg caught it, looked at it to assure himself of its goodness, spun it in the air after the manner of a pieman, and buttoned it up. Finally, he raised his hat an inch or two from his head with a military air, and, after pausing a moment with deep gravity, as to decide in which direction he should go, and to what Earl or Marquis among his friends he should give the preference in his next call, stuck his hands in his skirt-pockets and swaggered round the corner. Martin took the directly opposite course; and so, to his great content, they parted company. It was with a bitter sense of humiliation that he cursed, again and again, the mischance of having encountered this man in the pawnbroker's shop. The only comfort he had in the recollection was, Mr Tigg's voluntary avowal of a separation between himself and Slyme, that would at least prevent his circumstances (so Martin argued) from being known to any member of his family, the bare possibility of which filled him with shame and wounded pride. Abstractedly there was greater reason, perhaps, for supposing any declaration of Mr Tigg's to be false, than for attaching the least credence to it; but remembering the terms on which the intimacy between that gentleman and his bosom friend had subsisted, and the strong probability of Mr Tigg's having established an independent business of his own on Mr Slyme's connection, it had a reasonable appearance of probability; at all events, Martin hoped so; and that went a long way. His first step, now that he had a supply of ready money for his present necessities, was, to retain his bed at the public-house until further notice, and to write a formal note to Tom Pinch (for he knew Pecksniff would see it) requesting to have his clothes forwarded to London by coach, with a direction to be left at the office until called for. These measures taken, he passed the interval before the box arrived — three days — in making inquiries relative to American vessels, at the offices of various shipping-agents in the city; and in lingering about the docks and wharves, with the faint hope of stumbling upon some engagement for the voyage, as clerk or supercargo, or custodian of something or somebody, which would enable him to procure a free passage. But finding, soon, that no such means of employment were likely to present themselves, and dreading the consequences of delay, he drew up a short advertisement, stating what he wanted, and inserted it in the leading newspapers. 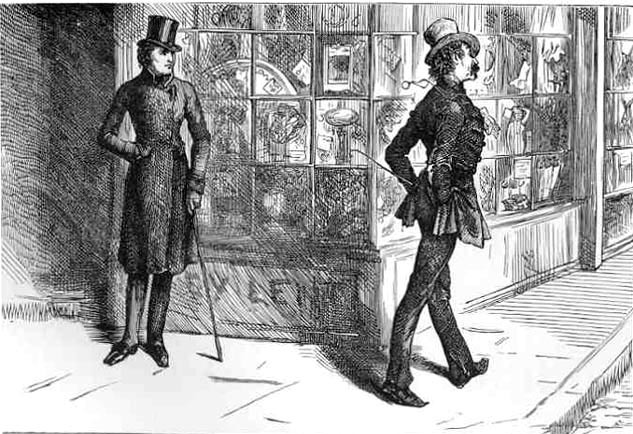 Pending the receipt of the twenty or thirty answers which he vaguely expected, he reduced his wardrobe to the narrowest limits consistent with decent respectability, and carried the overplus at different times to the pawnbroker's shop, for conversion into money. — Chapter 13, "Showing What Became of Martin and his Desperate Resolve, After He had left Mr. Pecksniff's House; What Persons He Encountered; What Anxieties He Suffered; And What News He Heard," p. 115-116. Dickens, Charles. The Life and Adventures of Martin Chuzzlewit. Il. Hablot Knight Browne. London: Chapman and Hall, 1844. _____. Martin Chuzzlewit. Works of Charles Dickens. Household Edition. 55 vols. Il. F. O. C. Darley and John Gilbert. New York: Sheldon and Co., 1863. Vol. 1 of 4. _____. The Life and Adventures of Martin Chuzzlewit. Il. Sol Eytinge, Junior. The Diamond Edition. Boston: Ticknor and Fields, 1867. _____. The Life and Adventures of Martin Chuzzlewit, with 59 illustrations by Fred Barnard. Household Edition, volume 2. London: Chapman and Hall, 1871-1880. The copy of the Household Edition from which this picture was scanned was the gift of George Gorniak, proprietor of The Dickens Magazine, whose subject for the fifth series, beginning in January 2008, was this novel. _____. Life and Adventures of Martin Chuzzlewit. Illustrated by Harry Furniss. The Charles Dickens Library Edition. 18 vols. London: Educational Book, 1910. Vol. 7. Steig, Michael. "Martin Chuzzlewit's Progress by Dickens and Phiz. Dickens Studies Annual 2 (1972): 119-149.